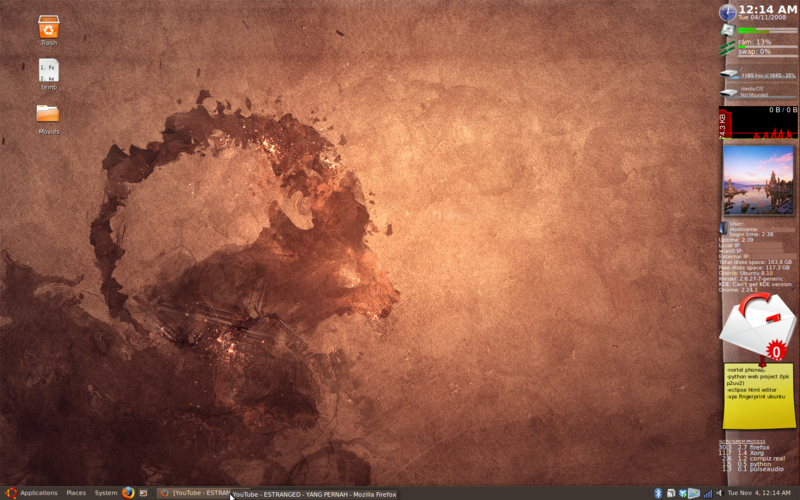 Following my previous post, finally I got the new Ubuntu 8.10 Intrepid Ibex on my Dell XPS M1530 laptop. The verdict: Pure Awesomeness. The installation is very quick and simple (it just that it took me a while to write this post). Almost everything works out of the box. The driver support is better. The OS itself I feel more stable, hard as a rock. And of course, more features. Sure, there is a few bumps, but nothing too serious. Wifi: Works right of the box. It has more features for you to configure your networking, such as wired connection, wireless, mobile broadband, VPN and DSL. It automatically reconnects upon waking up after hibernation. I had some issues about the nm-applet keyring keeps on asking me for admin’s password after reboot, but the solution is very simple. I will have another post for this one later. Nvidia Graphic Card: Works like a charm! Better than Hardy, where I had a few problem installing the driver the first time. The proprietary Nvidia accelerated graphics driver version 177 is very easy to install. All you have to do is activate it. NOTE: Please do system update (can be via Update Manager) before activating, otherwise it just doesn’t seem to install the driver. Webcam: Works in Ekiga, but not in Cheese unless I select 176×144 resolution. Trackpad/Touchpad: It’s working, but with BIOS A09, I had to change the /boot/grub/menu.lst like what I’ve mentioned in my post here. Sound and Mic: Working fine. Thumb print Reader: Never tested before. DVD Player, USB, Printer, HDMI, SD/MMC Card Reader: No in-depth test yet. 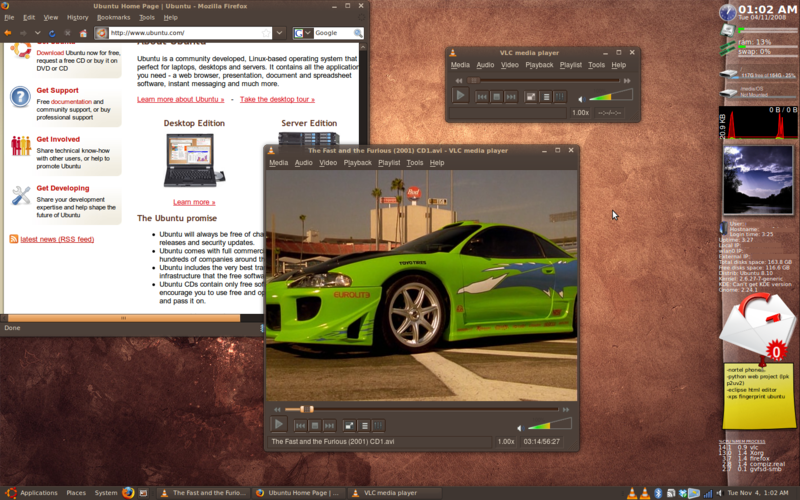 VLC: Works with brand new cool interface. 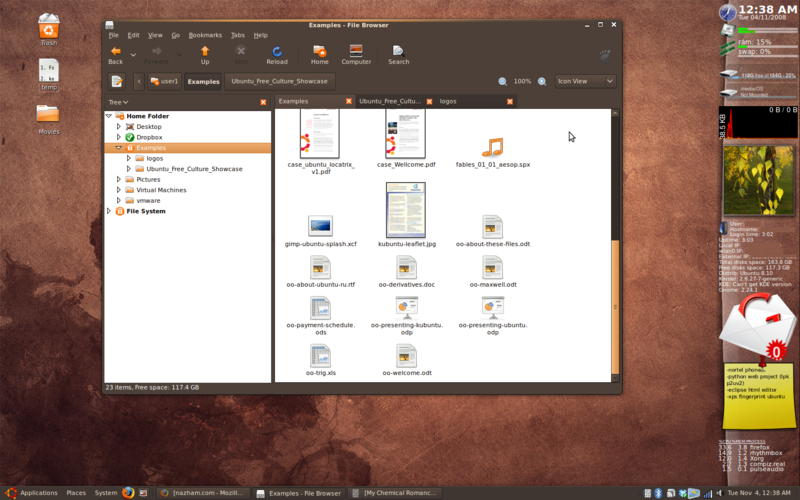 Nautilus: Comes with new tabbed interface. VMWare 1.0.7: Need patches to successfully install it. 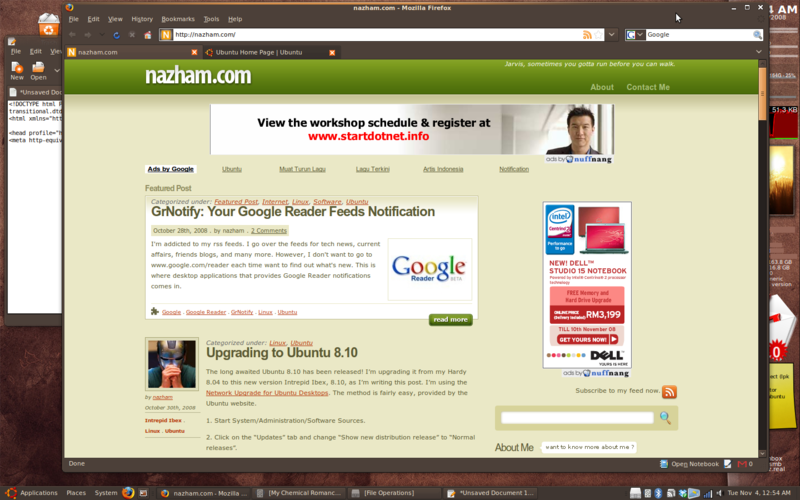 Perhaps I will post more detailed information later, but for the time being, please refer to this UbuntuForum. New DarkRoom Theme: Beautiful looking theme, but it renders some text unreadable. Gonna wait for the fix. Google Reader Notifier: Still notifying. Like previous release of Ubuntu, it never disappointed me. Looks like it’s here to stay! Whoa. Fantastic updates by Ubuntu. *Drools* I can’t wait to install this baby in my machine. I might update soon! I just installed Ubuntu on my dell Latitude D600. and like you said. Its Pure Awesomeness. The upgrades come in and the wireless card installs. I mean seriously what else do we need in life? Very nice thorough post, and I too use Ubuntu Hardy Heron for one of my laptops at home, I only keep windows around because I need it for printer and some other applications that I don’t like the equivs on unix yet. I do alot of Ubuntu posts about software and stuff on my blog too, happy to have you visit and see if you like any of the Ubuntu software I review. I have also installed ubuntu on my laptop. It is really good. Thanks for this post. Really help to resolve the track pad issue which turned me off venturing further into Ubuntu. 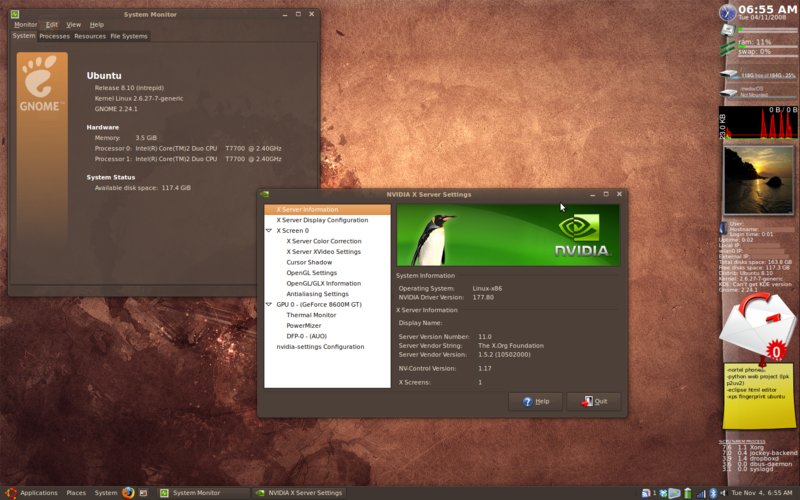 Note I have tested the video output via HDMI using the 177.80 Nvidia drivers and it works fine. Had to play around with the resolution on the primary display before it would work. Running 1920×1200 on primary and 720 on HDMI is ok. After enabling the second display the X-Server needs to restart (CTRL+ALT+Backspace) It a pity 1080 doesn’t appear to be supported though I have a 1080i TV which might be the issue. Can’t say I tested the audio output at this stage. My main problem I have now is getting my Dell Bluetooth headset to connect. The BT applet doesn’t seem to detect it and I don’t have a BT phone to test as an alternative. 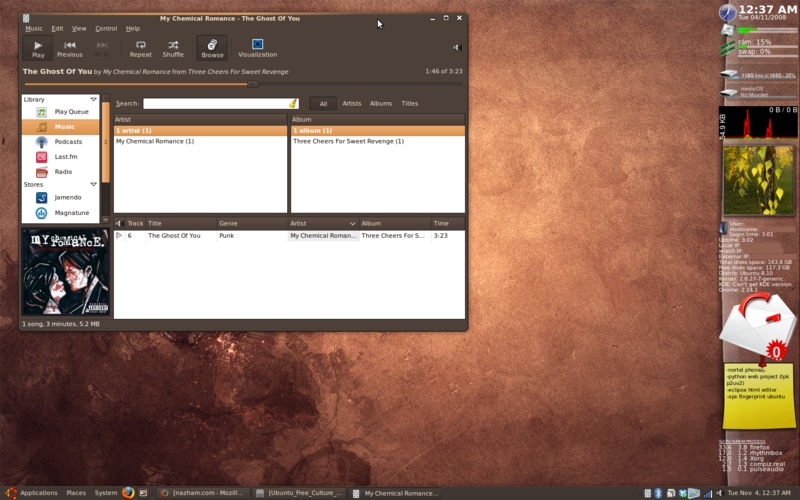 Also Unbuntu doesn’t appear to detect when a SD card is added to the integrated reader. Maybe someone is working on the driver for that bit. @dragon, @nihar: Thanks for the feedback. @ulcaria: Thanks for the HDMI feedback. I might gonna test it out on my machine. I hope you’ll resolve your Bluetooth issue soon. UBuntu is one of the best OS’s out there, I wouldn’t be surprised to see Windows in its own recycle bin. @dectroo, @gerardo: Yeah, Ubuntu is no doubt is one of the best. I bought my Dell XPS M1530 shortly after Christmas, and I bought it refurbished. I paid around $1300 (after many upgrades), but ended up saving around $600 just because it was refurbished. I bought it from the refurbished section of Dell’s website. I have been very pleased with it. I know many people don’t like Windows Vista (which came on this machine), but so far I have no complaints. It runs fast and has had no major issues.